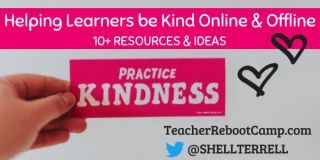 Kind Acts Take One Flyers– I’ve posted these flyers in my classroom to provide some suggestions on how students can be kind to their peers within the school. Students can choose (not required) to tear off one of the ideas and commit to completing that act within the week. Feel free to download and use any of these flyers (V1, V2, V3, V4). You can also quickly create your own with Poster My Wall, a free web tool for creating posters and flyers. Common Sense Power of Words Video– Students really loved this video about what to do when you’re bullied during a game. The video lead to powerful sharing and discussions with my elementary students about trash talking and bullying online. I followed up with student pair sharing on ways to be kind during a game, especially when we win. Children suggested sharing victory dances, asking to play again, reviving someone, saying, “GG!” (Good Game), or sharing their points or rewards. The classes also wrote kind messages on a poster. Common Sense Curriculum– The Digital Citizenship lesson plans and resources by Common Sense are full of engaging ways to get students to reflect on the choices they make online. The lesson plans come with Google Slides you can edit, objectives, and reflective activities and handouts. For example, my students used the Power of Words handout to give advice to someone being bullied in a game. A Kindness Tree Project by PBS– The class creates a tree on one wall with examples, drawings, and photos of how people have been kind to them. Free Rice– When students finish their work they have a list of typing games or educational websites to visit listed on our class website. This month students also have Free Rice as one of their options, which is a free game where students can answer trivia or multiplication questions and earn rice for hungry people around the world. So many of the students are choosing to play FreeRice during their free time instead of the other games. Some have told me they even do it at home and show their parents! Be My Eyes App– I downloaded this free app to help blind people with real world problems they face and keep it on in case we get a call during class. I showed students the website’s video and explained how the app gives us the opportunity to help others. The students are so excited some had their parents download the app. Some asked if we could call and just randomly help. Digital Compass Game– This is one of the games my older students can play to help them evaluate real situations they will face when navigating the web and joining social networks. Students have to choose what they will do for a character facing the situation then see the outcome of these choices. Cool School Game– For elementary students. Children go into this school and help the children settle conflicts and keep the peace. Citizen Science Projects– This is one of the student digital missions in my new book, Hacking Digital Learning with Missions. Students can help scientists and researchers with their quests to archive history or gather data to help find solutions to real world issues. Find projects for students to support any curriculum at SciStarter.com and Zooniverse.org. Crowdfund Campaigns– Get students to create a social media campaign for a local cause and raise the funds. This is one of the student digital missions in my book. Check out these crowdfunding websites- DonorsChoose, PledgeCents, ClassWish, Adopt-a-Classroom, and Digital Wish. Find some great examples of students crowdfunding in this article. Check out this crowdfunding guide by Edutopia. Create a Book to Help Others– Find free web tools and ideas here on how students can create a digital book to help others. Challenge: Challenge your students to spread kindness and reflect on how their words and actions impact others. Shelly Terrell is a Technology and Computer teacher, education consultant, and author of books including Hacking Digital Learning Strategies: 10 Ways to Launch EdTech Missions in Your Classroom. Read more at teacherrebootcamp.com.